A Mitsubishi Electric High Wall Heat Pump with Wi-Fi Control including installation* - worth over $2,000! The new Mitsubishi Electric GL25 EcoCore High Wall Heat Pump sets a new standard in super energy efficient heating. This fabulous prize includes the new EcoCore High Wall Heat Pump, Wi-Fi Control and standard back-to-back installation - worth over $2,839.00 RRP! With 2.5kW heating capacity, this model uses next generation EcoCore Technology and is whisper quiet at a hushed 19dBA - perfect for bedrooms. But, this model doesn’t stop there. Equipped with an Anti-Allergy Enzyme Filter, the EcoCore High Wall Heat Pump traps harmful particles such as allergens, bacteria and viruses, so you breathe easy with cleaner air. 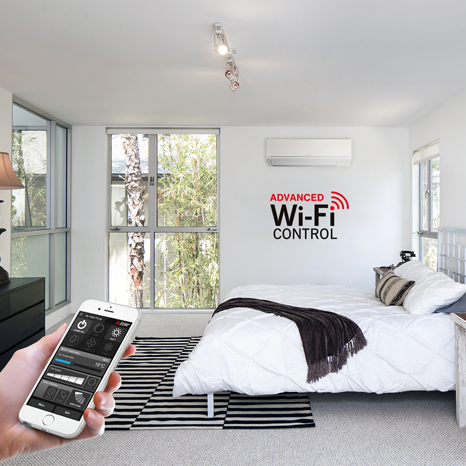 Created to suit New Zealander's busy lifestyles, Mitsubishi Electric's award-winning Wi-Fi Heat Pump Control unlocks the door to smarter heating or cooling, for total home comfort wherever you are. This innovative technology connects your Mitsubishi Electric High Wall and Floor Mounted Heat Pump(s) to your smartphone, tablet or online account, giving you the freedom to fully control each unit on-the-go via an internet connection. Unique to Mitsubishi Electric Wi-Fi Control are advanced functions such as the ‘minimum or maximum room temperature’ rule settings. Ideal for children’s bedrooms, these features actively monitor your room’s temperature, automatically turning your heat pump on or off once your customised temperature setting is reached. With installation of a Wi-Fi Control Interface on each heat pump, your Mitsubishi Electric Wi-Fi Control App becomes capable of seamless multiple heat pump control. With cutting-edge inverter technology and the development of a high performance heat exchanger, this GL Series has earned the Energy Star® mark. Our i-save and Econo Cool modes are included on all GL models. i-save mode allows you to save temperature and fan speed combinations, returning to these at the touch of a button and Econo Cool provides maximum energy efficiency in cooling mode.